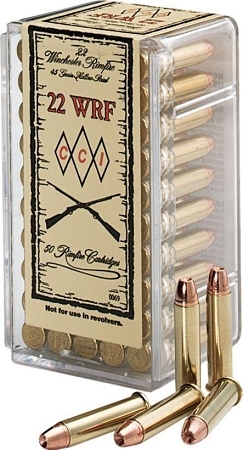 The CCI name has provided high-quality rounds, like this .22 WRF Rimfire Ammunition, since the 1960's. The cartridge is designed with the Winchester Models 1906 and 1890 in mind to provide the best performance without damaging your firearm. They aren't your standard lead bullet that doesn't always shoot well in older barrels because of the age. These rounds have a soft copper jacket that is gentler on older weapons. This design has been shown to dramatically improve the weapon's terminal performance on small game. The only JHP load available for this venerable cartridge. Pure copper jacket is easy on old barrels. Clean-burning propellants keep actions cleaner. Sure-fire CCI priming. Reusable plastic box with dispenser lid. Perfect condition, fair price for hard-to-find ammo, quick shipping. Happy customer!